Apparently it’s Bryan Rockenbach’s world – we’re all just living in it. 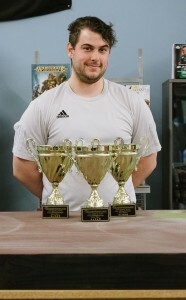 Bryan Rockenbach snuck into the Top 8 in the final 53-person City Championship as the 8th seed and proceeded to make his way to his third City Championship title. This should soundly put him as the favorite going into Legacy Series Masters. But let’s not forget the rest of the tournament – Eddie Caudill earned the pass down invite from Bryan Rockenbach, piloting Grixis Delver to the finals. Tony Murata put down his trusty 12Post deck for this tournament and was rewarded heavily with a Top 8 berth, taking up a blistering fast BR Reanimator deck featuring everyone’s favorite insane sire. Burn also found itself in the Top 8, with Christopher Pimental blazing through the Swiss rounds. We also saw a unique take on Death and Taxes, piloted by Riad Mourssali. The deck looks like your standard Death and Taxes deck until, well, you cast Abrupt Decay on a Thalia, Guardian of Thraben and seeing the Decay get Spell Queller’d! Or maybe Geist of Saint Traft is more your style – it features that too! See below for coverage of the Tempe City Championships. We’ll see the 16 qualified players at Play or Draw on September 4th!